In 2003 we had the pleasure of joining track 3, a volunteer non-profit organization that teaches children and youth with disabilities to downhill ski and snowboard. Although the club is recreation oriented, many of the club members participate in the Canadian Association for Disabled Skiers (C.A.D.S.) National Ski Championship races held in places such as Banff, Alberta and Kimberley, British Columbia. Through the years, the club has developed skiers who have won gold medals in both Alpine and Nordic events at the World Championships for Disabled Skiers. "I have been a guide with the Toronto Ski Hawks for 25 years and every year is awe-inspiring! Initially my son asked me to bring him to an event because he wanted to try skiing. As a non skier myself, they asked me to learn to ski and become a guide. 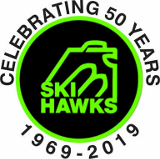 Within a couple of years, I was trained as a guide and now, my son's career takes him away from skiing and I am still guiding for the Ski Hawks. I cannot imagine a better volunteer experience."